No place else can you experience fall quite like you will here in the Midwest. Because it’s a season to savor, we’ve assembled a list of our favorite ways to enjoy autumn in northwest Chicagoland. The farmers market on Woodstock Square runs through October and draws together local farmers selling a variety of goods and produce. Come November, the market continues indoors at the county fairgrounds. Admit it: Every time autumn comes around, you make a secret list of activities you just have to enjoy. Sure, your list includes classics like visiting an apple orchard, grilling some sweet corn, and savoring the last throes of summertime. This year, allow us to add a few must-dos to your list. After all, a Midwestern autumn is just too short and too special to let it slip away unappreciated. Maybe some of these are already on your list. If not, then pack up the family and set out to make this a memorable autumn. The vibrant palette of fall foliage is the hallmark of a Midwestern autumn, and with peak color expected to hit around mid-October, there’s plenty of time to enjoy our changing landscape. For a truly personal glimpse of this year’s color, a trek through the woods is in order. This time of year, the canyons of Starved Rock State Park, in Utica, are aflame with vibrant colors. Get away for a weekend at the Starved Rock Lodge and you can enjoy sweeping vistas from the Lodge and the nearby trails. Closer to home, one of your best choices is to stroll through Morton Arboretum, in Lisle, where you can explore 1,700 acres filled with trees from more than 40 countries. Look for fun fall activities all season long. McHenry County’s impressive Glacial Park, in Ringwood, reveals the bright golds, scarlets and oranges of Illinois’ signature prairie landscape. Follow five miles of trails through oak savannas, wetlands and marshes, around bogs and past kames – large hills made of glacially deposited gravel. Time it right, and you may also hear the squawking sandhill cranes passing overhead or resting on their migration. Bonus: Explore some of Kane County Forest Preserve’s properties, including Brunner Family preserve, Tekakwitha Woods preserve, and the Fox River Bluff preserves, for gorgeous views of the Fox River Valley. It’s harvest time here in the Midwest, and that means plenty of fresh produce to be had. Visit the Woodstock Farmers Market on the Woodstock Square every Tuesday and Saturday through October and stock up on fresh sweet corn, apples, honey and plenty of other foods all raised within about two hours of McHenry County. Once the weather’s too cold, vendors head indoors to the nearby county fairgrounds for the winter market. Of course, no autumn is complete without a trip to the apple orchard, and our region has an ample selection, from All Seasons Orchard in Woodstock to Enjoy Pioneer Farm in Hampshire and Goebbert’s in both Hampshire and South Barrington. For a true farm experience, visit Primrose Farm, in St. Charles, and find out what farm life was like in the 1940s. The working history farm, owned by St. Charles Park District, has chickens, pigs, sheep, horses and cows – all easily accessible for youngsters to meet and touch. The farm is open Mondays through Saturdays from 8 a.m. to 3 p.m., and interpreters are ready to share their stories. 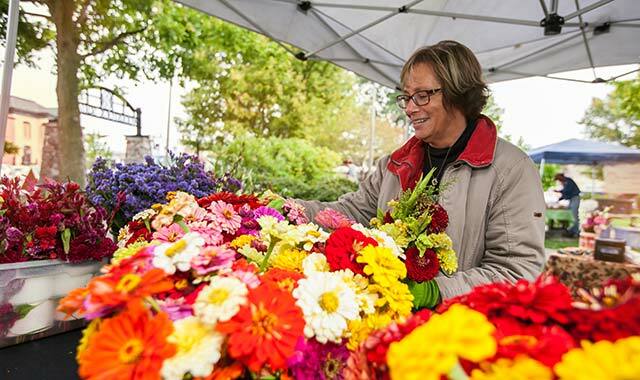 Bonus: Barrington’s farmers market, held Thursdays at Park Avenue and Cook Street, runs through Oct. 19. Visit Geneva’s French Market Sunday mornings through Nov. 10 at the commuter parking lot, the St. Charles farmers market Friday mornings through October at the Baker Memorial United Methodist Church, and the Elgin Harvest Market every Thursday through Oct. 5 in downtown. The fall harvest yields an abundance of fresh produce, but there are many treats that make our autumn complete – like pies, doughnuts and other baked goods. Royal Oak Farm, near Harvard, raises more than 30 varieties of apples on its 120-acre farm, and you’ll find many of them well-suited for your own warm pies. Stop in the bakery and snag some fresh cider, apple cider donuts, farm-fresh honey, a homebaked chicken pot pie and more. This time of year you’ll also see a flurry of activity inside the kitchen of Sweet Natalie’s Gluten-Free Bakery, in downtown Geneva. The unique culinary incubator draws together many local bakers who serve up treats aimed at people looking for gluten-free, dairy-free, vegan, paleo and low-sugar sweets. Bonus: Huntley’s biggest food celebration of the year is the 35th annual Turkey Testicle Festival, held just before Thanksgiving at Parkside Pub downtown. It’s time once again to catch some football action, and we’re not talking about the NFL or Big Ten. Close to home, you can catch Division I college football with the Northern Illinois Huskies in DeKalb. Tailgating is encouraged during home games as soon as parking lots open – either 5 or 3.5 hours before kickoff, depending on where you park. Our region is also home to some of the state’s top high school football programs and some of the most enthusiastic student cheer sections around. 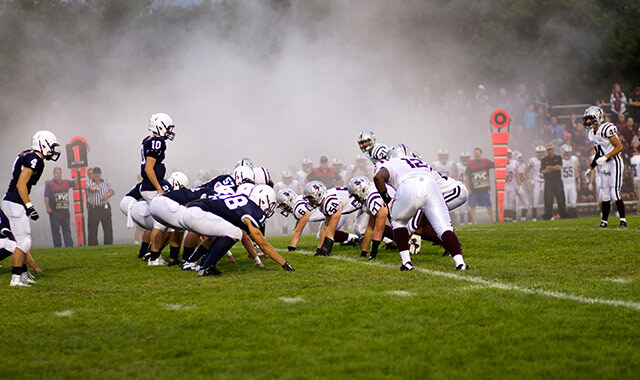 Cheer on your local team or root for the Prairie Ridge Wolves of Crystal Lake, last year’s 6A state champions; the Johnsburg Skyhawks, last year’s 4A runner-up; or the Cary-Grove Trojans, Batavia Bulldogs and Lake Zurich Bears – all recent state champions. While many suburbanites head to the woods on a deer hunt this fall, many others will head out for an entirely different type of hunt: an antiquing expedition. Nowhere in the region does antiquing get as serious as it does at the Kane County Fairgrounds, in St. Charles. Catch the 43rd Fall Fox Valley Antiques Show Oct. 14-15 and meet some 55 dealers with all variety of Americana, furniture, arts, crafts and other unique finds. And don’t miss the Kane County Flea Market, which spreads across the entire fairgrounds. Held the first weekend of every month, this nearly 50-year-old tradition is not to be missed by the serious hunter. Not too far away, you’ll catch great antique hunting in the downtowns of Geneva, St. Charles and Elgin. Head north into McHenry County and you’ll find a unique collection of antiques retailers in downtown Hebron. Further east, check out the Volo Antique Malls – four buildings with about 300 dealers on hand. Bonus: Head west from Hebron and check out the Roscoe Antique Mall, in South Beloit, Ill., which has about 100 seasoned dealers displaying quality antiques from the 1800s through the 1960s. Scorched Earth Brewing Co., located in an industrial area of Algonquin, specializes in beer brewed with locally sourced ingredients. Ask about its lineup of seasonal beers and fall specials. As the grapes ripen at our area’s vineyards, it’s an ideal time to sample vintages new and old alike. Prairie State Winery, in Genoa, is DeKalb County’s oldest winery and it produces some 35 varieties from grapes grown locally. Look for flavorful touches, like ginger and elderberry, that make these full-bodied wines so aromatic. 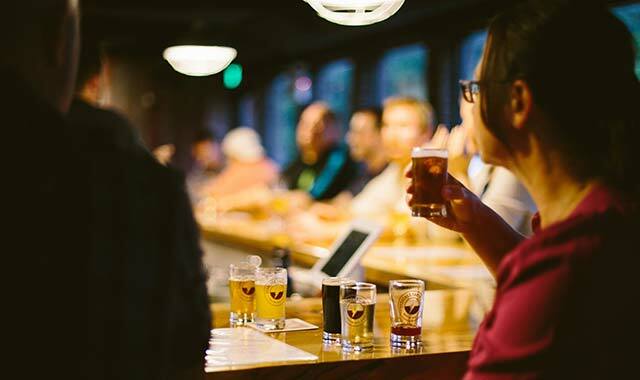 No Octoberfest celebration is complete without a little craft beer, and you can find quality selections at many local breweries, several of which focus solely on beer. Crystal Lake Brewing Co. has won international awards for its German-style lager, and it’s gained a loyal following for its other unique drafts. Ask about the seasonal specials found at its downtown Crystal Lake taproom. Head south to Algonquin and discover Scorched Earth Brewing Co., which prides itself on locally sourced ingredients and a unique lineup of seasonal beers. Nearby you’ll also find Village Vintner Winery & Brewery with a lineup of handcrafted wines and house brews that you can sample in the tasting room or at the full-service restaurant. Bonus: Head west to Galena in mid-November for the annual Nouveau celebration – a weekend dedicated to the first tapping of the newest vintage at Galena Cellars Winery. It’s your last chance to hone your game this season, and you’ll find some great deals on late-day golfing at many area courses. It’s also a prime opportunity to take in the enthralling autumn color. Test out the nine-hole Pottawatomie Golf Course, in St. Charles, and you’ll have an unqualified view of the Fox River and its beautiful scenery. Several holes make a water hazard out of the river. The color’s also fantastic around the sparkling waters of the public Bridges of Poplar Creek Country Club, in Hoffman Estates, and Bowes Creek Golf Course, in Elgin, where water factors heavily into the course designs. Enjoy sweeping vistas from the wide-open landscape at Blackstone Golf Club, in Marengo, and the rolling hills of Pinecrest Golf Course, in Huntley. Bonus: For unforgettable scenery and a wicked course design, try Aldeen Golf Club, in Rockford, where every hole inspires thoughtful play. Go ahead, embrace the macabre. This year marks the 30th annual Bluff City Cemetery Walk in Elgin, led by the Elgin History Museum. Held Sept. 24, the 90-minute tour takes you through the Bluff City Cemetery and past the graves of several former residents, all portrayed by local actors. Tickets can be purchased in advance or the day of the event. Get spooked in Geneva as the Geneva History Museum leads a series of cemetery walks and ghost tours. Tickets are required. Tour West Side Cemetery on Oct. 7 and learn about tombstone symbolism and local settlers. Then, tour Oak Hill Cemetery on Oct. 21. The museum’s ghost tours fill up fast on Oct. 28, when volunteers introduce visitors to some of the city’s most legendary places for sighting the supernatural. Bonus: Uncover Sycamore’s past with Sycamore History Museum’s cemetery walk on Oct. 1. Eight to 10 actors will portray teenagers, teachers and civic leaders as they take you through Elmwood Cemetery. Cost is $5. Meet at the new mausoleum. Once the sun’s gone down and the chilly winds blow, it’s time to head indoors to the region’s top performing arts venues. In Barrington, a growing events calendar at Barrington’s White House draws top-notch musical performances and unique lectures by the likes of Ron Keating, who portrays Winston Churchill Oct. 22. The White House is also a little-known stop for members of Elgin Symphony Orchestra, an award-winning ensemble that usually plays at Elgin’s Hemmens Cultural Center and Schaumburg’s Prairie Center for the Arts – both venerable venues in their own rights. The new ESO season kicks off Sept. 16. Audiences are drawn to a diverse lineup at the intimate Metropolis Performing Arts Center, in Arlington Heights, where the typical season includes Broadway plays, up-and-coming musicians and uproarious appearances by Chicago’s Second City. Bonus: Aurora’s Paramount Theatre is recogized for its lineup of Broadway-quality musicals and big-name performers, while Woodstock Opera House remains an intimate setting for plays, musicals and lectures. Sometimes, the best way to enjoy fall’s bounteous palette is to just get out and drive. One of the most colorful drives in our region is along Illinois Route 31, as it snakes along the Fox River from Algonquin to Aurora. North of Elgin, this drive takes you around rolling hills and brilliantly illuminated forests. South of Elgin, you’ll pass through hilly terrain and quaint downtown districts, all sporting magnificent views of the river. For an even better view, grab your bike and hit the Fox River Trail, which snakes along the river from Aurora to Algonquin, on up through McHenry County. Get off the main roads and you’ll find a myriad of scenic places as you pass farmland along Garden Valley Road, east of Woodstock, and country estates on Plum Tree Road, in Barrington Hills. This entry was posted on Tuesday, September 12th, 2017 at 12:00 pm	and is filed under Features, Top Posts. You can follow any responses to this entry through the RSS 2.0 feed. Both comments and pings are currently closed.